My second Q plate car (after the Land Rover). It was a 1989 built car with a Ford 1600 X-flow engine. being an SE it had live axle rear suspension. I bought this car privately for �00 from a man on a farm near Worcester. I bought this as a fun car, and it certainly was. Over the time I had the car I had to do various bits of work. Most fundamental was replacing the fuel tank and fuel lines. The original tank was a "donor" tank, which was steel and rusty. This was a shame as most of the car was a much higher standard. 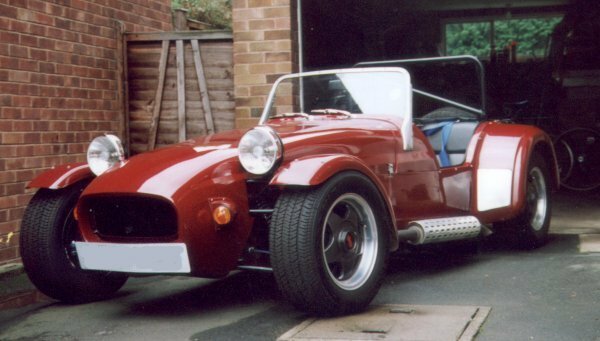 I replaced the tank with a proper Westfield Alloy tank, and also replaced all of the fuel lines, as they had been put in using reinforced plastic (nitril?) tube rather than proper metal stuff.. Eventually sold the car for �50 to a lad from Alton. He got a good deal, but I had had good value from my period of ownership. I'll buy another one of these one day!